Hey, did you listen to part one of The Graveyard Show podcast that features moi and Shannon Lark? Well, if you haven't, it's not to late. If you have, you may (or, frankly, you may not) be pleased to know that part two of the show has been posted. If my memory serves me at all, I think we got into a lively discussion about the social responsibilities that actors have (or don't have), and horrordom's favorite vampire movie, Twilight. Give it a listen- all the cool kids are doing it, I swear. I know that doesn't make any sense whatsoever and the whole analogy or metaphor or what have you falls apart as soon as you think about it...but look, I'm desperate for excuses to post pictures of the Sagal twins around here, so I'll take what I can get. And so will you! And you'll LIKE it! Big thanks to The Graveyard Show for asking me back, although I find the pressure to not be a boring guest rather stressful. Hooray! 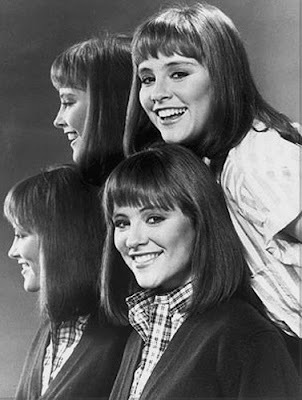 OMG I loved those twins from the short-lived sitcom "Double Trouble" and one of the greatest movies to ever come out of the 80's- yes, you guessed it- "Grease 2"...! That's crap. If we're getting "Double Trouble" references, than I demand equal time for the "It's Your Move" contingent. I so loved "Double Trouble"! God I'm getting old. The twins really resembled their older sis, Mrs.Peggy Bundy herself!